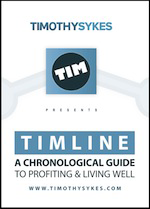 TIMline is a 14+ hour DVD of the 5th annual PennyStocking conference from October 2012. Over a dozen expert traders share their insights and Tim unveils his TIMline, a chronological guide to profiting from the stock market, broken down by hour so students finally have a step-by-step guide on how he expects stocks to move, both up and down, throughout the course of the trading day. *This purchase is for streaming access only. No physical product is shipped.